From installation to maintenance, we are the "grow" to for a beautiful lawn! Experience the many conveniences and quality assurance from our expert installation. Homeowners and businesses alike choose us because they get what they pay for. In fact, we go above and beyond. We are experts in sod growth, so we can provide our own product for your home, business, or athletic field. But just as we are experts in growing sod, we are experts in laying sod. Our lawn service is among the best in Indiana, and we’ll work to make sure you feel the same way. We have built a reputation with consumers that we is trustworthy, skilled and quality, so don’t hesitate to call us any longer. Put your trust in us and have a lawn or field you can be proud of. 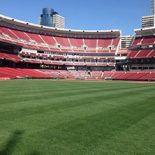 Here at Moster Turf, we take pride in providing lawn care and full-service sod installation for people throughout Indiana, Ohio, and Kentucky. We are experts in installing turf for sports fields, such as baseball, football and soccer fields. 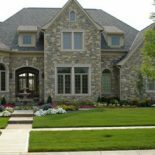 In addition to providing you with the best turf for sale, we also offer lawn service with more than 30 years of experience under our belts. We aim to provide each of our customers with the best lawn aeration services, sod rolls and lawn care so that you can have beautiful grass that you can be proud to show off. We know how important your lawn or athletic field is to you, so we work to make sure that we take care of it just as we would our own. We offer services for homes, commercial businesses and athletic fields. We’ll make sure that your athletic field is one you can be proud to call your home field. When you work with Moster Turf, you not only get top-of-the-line sod, but you also get unwavering customer service. 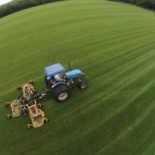 Customer satisfaction is at the pinnacle of our business, and we’ll always provide you with the lawn care or athletic field care that you need.